How The Trump Administration's Transgender Troop Ban Is Affecting One Military Family The Trump administration gave transgender service members a deadline to secure a medical diagnosis before the new ban took hold. But military families are struggling with the accelerated timeline. That's when the Trump administration's new policy on transgender military service takes effect. It effectively bans transgender people from joining the military. The more than 14,000 already serving will be allowed to do so openly, so long as they have that formal diagnosis of gender dysphoria filed by the deadline. If not, they must serve under the gender assigned them at birth - or leave the armed forces. President Trump first announced the ban in July 2017. B, who is in the Air Force, met that deadline when a civilian doctor in Ithaca, New York secured their diagnosis. But B's personal journey of identity — shared with their wife Peg — is far from finished. "I realize that I'm scared," Peg said. "It's accelerated everything so quickly...all of a sudden, we're being forced to make this choice that I don't think we were quite at yet." The Diagnostic and Statistical Manual of Mental Disorders defines gender dysphoria as "a difference between one's experienced/expressed gender and assigned gender, and significant distress or problems functioning." B says that language, specifically the term "distressed," was a major disincentive in deciding whether to get the diagnosis — that the idea of having such a medical designation in their employment file is painful, especially when being transgender has never affected their job performance. And for Peg, making the diagnosis official at this point was unwelcome. She just wasn't ready. "I have my own journey to deal with," she says. "I met Bryan. I fell in love with Bryan. I married Bryan. We had kids. We moved on. Bree has come into our lives but it's almost like bringing a new person in. It challenges everything from my sexuality to my femininity. And that is a hard thing for me to deal with on a daily basis, let alone have someone come up to me and say 'deal with it faster.' "
Not that Peg isn't grateful that the diagnosis came through, mere days before the deadline. She remembers what it was like to live what she calls an "edited life" before the Obama administration announced it would allow transgender people in the military in 2016. 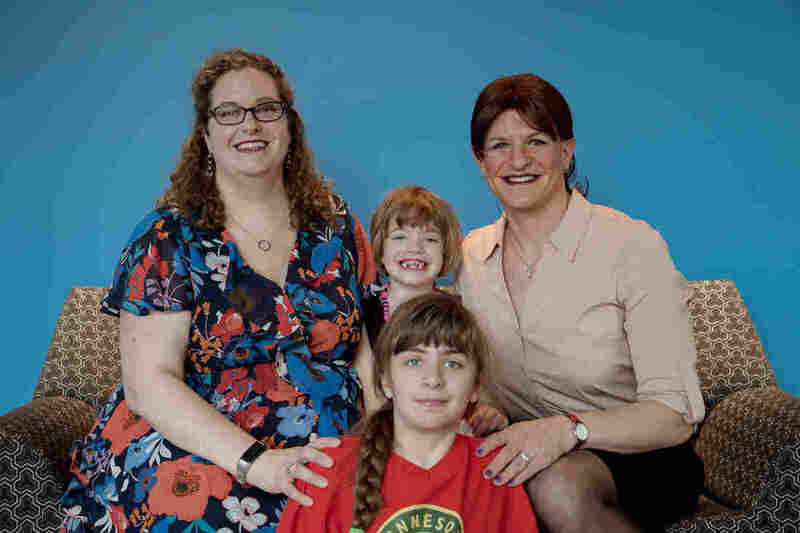 They have two kids, six and ten, who see their dad's gender identity as "business as usual." But Peg says the family spent years hiding B's gender dysphoria, afraid it would destroy their military career. B remembers, too — and doesn't want transgender troops who missed the deadline, current and future, to go through that. A week after the doctor's appointment, the Fram family traveled to Washington so B could meet with members of Congress and talk about the Trump administration's ban. B told lawmakers how much harder it is to serve when forced to stay in the closet...or, in the case of those who don't get the diagnosis in time, forced back into the closet. "You don't have to have this filter in your brain that has to sit between your thoughts and the words or actions that come out of you...you can reach your full potential." So why not take that potential elsewhere? Leave the military for a job where the policy doesn't affect B and their family? "I have so much invested in the military," says B. "The reasons why I joined haven't changed...I joined right after September 11th. That had a profound impact on me and my ability to give back," adding that the military is where they found purpose. That's what's at stake for the service members who didn't manage to get a diagnosis in time. B works with SPART*A, an organization that represents active duty transgender service members. The group was working with several people trying to file their paperwork up until the last minute. Delays took many forms, particularly for those serving remotely where military doctors are not available. Even if a soldier gets a diagnosis from a civilian doctor, the paperwork needs a signature from a military medical professional. And that paperwork itself raises other concerns for the Frams. Having lived through several policy changes as a military spouse, Peg is wary of how the documentation of B's gender dysphoria might be used in the future. "It opened up another avenue of fear for me," says Peg. "Now that they've been forced to go into this box, it's easier to call them out later." "The fear is always that this is the tip of the iceberg," says B, believing the current policy is already a social step backward. "What comes next?" Selena Simmons-Duffin edited this story for broadcast.